Home movie footage shot during a taping of WGN's Bozo's Circus in 1977 with Frazier Thomas and the legendary lineup of Marshall "Wizzo" Brodien, Roy "Cookie" Brown and Bob "Bozo" Bell. 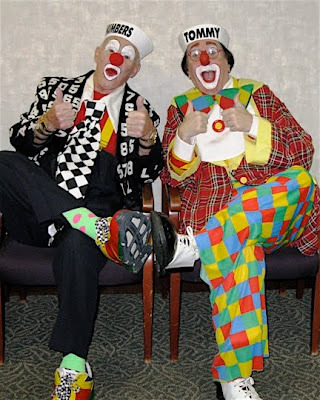 I remember before the taping of the show that I attended, Bozo was introduced and came running into the studio. The young child next to me was awe-struck. He was in shock. He just repeated the words "Bozo came out" throughout almost the entire taping. I totally knew what he meant. Bozo had only been a thing that he'd seen on TV and here he was in the flesh and and bigger than life. I felt the same way, but I was in my 20s. photo taken on the Bill Hall "Twas The Show Before Christmas" tour. 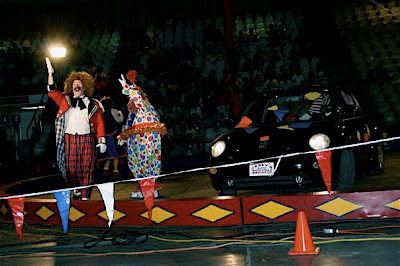 One element of the circus continues to terrorize adults to this day, and that’s coulrophobia, the fear of clowns. Thanks to horror films like Killer Klowns From Outer Space and Stephen King’s It, the “Bozo Syndrome” doesn’t fade; it intensifies. So if smiling-face makeup makes you shiver, you’ll feel relieved to know that the Ringling Bros. and Barnum & Bailey Circus’ latest show, Illuscination, involves much more then multiple clown demons spawning from a small car. The new act features magic and illusions from David DaVinci, an “illuscinator” from Orlando. Your eyes will be fixated on this modern-day Houdini as he attempts to escape a straitjacket while suspended over a den of lions. Astonishing acrobats and aerialists will fly over your head. Asian Elephants will parade under the big top in majestic glory for your enjoyment — unless, of course, you also suffer from pachydermophia (the fear of elephants); then there’s no help for you. Find the South Florida Fairgrounds at 9067 Southern Blvd. in West Palm Beach. Tickets start at $15. The circus runs until December 28. Call 561-798-3247, or visit ringling.com. MR. SAUER DIRECTLY VIA HIS EMAIL. I'm guessing it was circa 1959, before Coco was with Ringling... 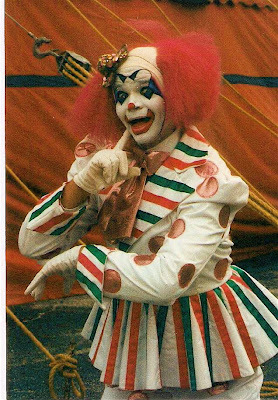 I had seen five years worth of Ringling shows and had the clown pages of the RBB&B programs thoroughly memorized. I thought I "knew" clowns. Then my dad took me to see the Mills Bros. Circus. Mike came out on tall stilts, so tall he was touching the tent top of the tent. WOW!!! Then, on that verrry cooold September night, he did a water gag that doused him with gallons of water! 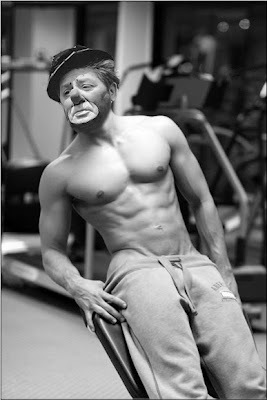 I was sure he'd catch pneumonia but I thought, "Now THAT'S a CLOWN!" 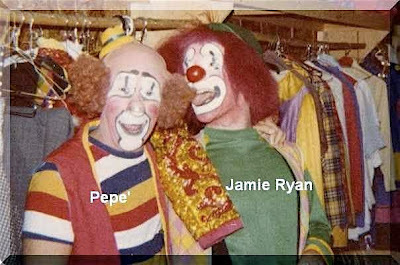 Tom "Pepe" Piccard and Jamie Ryan. Rik "Bonzo Crunch" Gern did a recent USO Christmas party at Ft. Hood. It was part of their effort to help everyone in the community pull together after the recent shootings. A Jonas Brother was there, something called Chamillioniare and MTV covered it, but it was still a very cool thing to be a part of anyway. He even got to meet Lambchop! Click the title of this post to be taken to the MTV News coverage of the event. For Improv Everywhere's latest public spectacle, its agents recruited a 13-member handbell choir to "provided some unexpected accompaniment for a Salvation Army bell ringer on Lexington Avenue in Manhattan. Watching the expression on the actual bell ringer's face during the slow build of the chorus of "Joy to the World" is truly heartwarming. To read how much work went into this event, please click the title of this post. Please submit any favorite 70s era photos by this Saturday (December 19th) for inclusion in this years clownalley.net video Christmas Card project. We've got some great ones. If you have any video to include, we're going to need to speak to the good people at FedEx. Please email all photos (in jpg format) to cashincomedy@yahoo.com. Dale Alan Longmire, 59, of Sarasota, Fla., died on Dec. 11, 2009, at Ridgelake Hospital, following an extended illness. He was born Feb. 23, 1950, son of Rose and the late Ed Longmire. Dale graduated from Parkersburg High School in 1968. He graduated from West Virginia University in 1972. He fell in love with the circus when he was five years old. The circus was his one ambition and after graduating from college, he sent an application to Ringling Bros. Clown College. Out of 3,000 applicants, he was one of 50 chosen to attend. He traveled throughout the United States, performing in many cities. He also performed in New York at Madison Square Garden. He designed the costumes he wore. 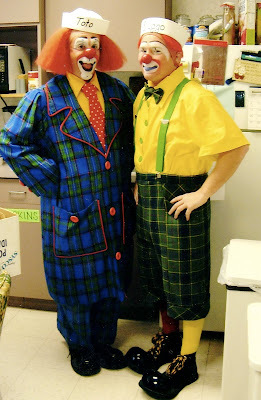 Just recently, an anonymous circus fan sent an email stating Dale was a beautiful clown and had the most beautiful costumes he had ever seen. He also performed with Vargas, Bently Brothers and recently worked for Walker Brothers Circus in Sarasota, where he was the office manager. He was a lifetime member of First Methodist Church in Parkersburg. He will be sadly missed, not only by his family and friends in Parkersburg, but his wonderful adopted "family" in the circus world. Dale was preceded in death by his father, Ed Longmire. Surviving are his mother, Rose; a brother and sister, Tom Longmire of Parkersburg and Linda Mason and husband, Mike, of Knoxville, Tenn.; one nephew, Tommy Mason and his daughters, Sidney and Shea of Knoxville, Tenn.; one niece, Rebecca Mason and her daughter, Shelby of Knoxville; uncles, Reese Blizzard of Parkersburg and Wayne and his wife, Jackie Longmire; and cousins, Christine and Bruce Wilson, Jenny and Mike Knotts, Joe and John Longmire. There will be a visitation from 4-6 p.m. Thursday, Dec. 17, at Leavitt Funeral Home. Services will be 3 p.m. Friday. Burial will follow at Mount Olivet Cemetery with Dr. Tim Allen officiating. After the first of the year, a memorial service will be held in Sarasota, Fla., at "Showfolks" where he was president for two years. After a brave battle and a long illness, the world lost Dale Longmire last Friday morning. He passed quietly, surrounded by family and friends. To say that Dale was the consummate glamorous whiteface picture clown and that he was absolutely essential in making the Vargas show equal in three ring splendor to just about any show in American circus history would be a vast, vast understatement. 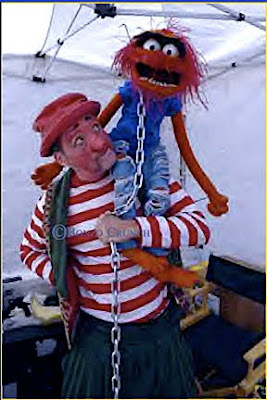 Dale was a fixture on the Red Unit, Circus Vargas and Bentley Bros. Circus for many years. He designed and produced the spec for Vargas while he was there, making it the ritziest tent show on the road since TGSOE folded its tent back in '56. I never once saw Dale not be 100% professional--immaculate, flashy wardrobe, perfect make-up, huge stage presence. After Richard Mann left RBBB, Dale was the center pole of spec, and really knew how to work it. I worked with him a few times at the Sarasota Circus Festival and the Gibsonton Showmens Club Circus. Dale started his long battle with cancer when he was about 16 years old back in his hometown of Parkersburg, WV. He was determined not to let it rule his life. See if you can get hold of Bruce Gutilla to get some good stories of Dale. 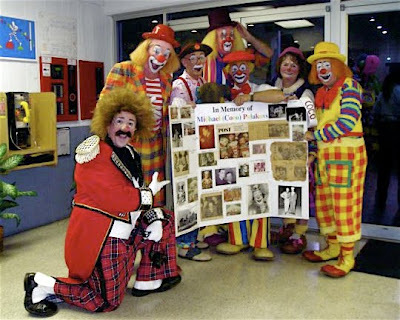 The clowns of the 2009 Showfolks Circus in Sarasota holding a memorial picture board that was placed in the lobby. On the upper corner of the board I placed the Coco hat that I'd brought with me. Originally it rested in a place of honor on the wardrobe rack in the Alley. 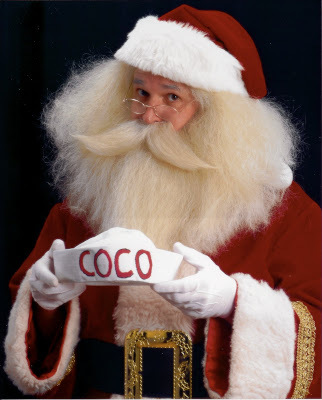 My Coco tribute as Santa. Toto Johnson and Wayne Weems at their show in Iowa this past weekend. 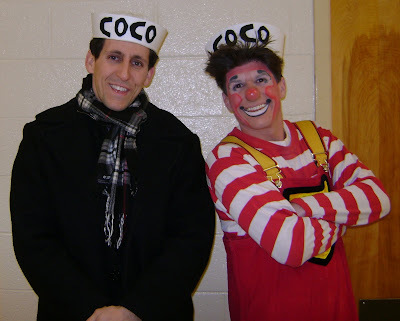 If you are working this holiday season, as a clown, a Santa, a stiltwalker, juggler... whatever, please stop at Party City and pick up a sailor hat for two or three dollars, write your name or Coco's on the hat with magic marker and take a picture of yourself. We'll post them all here just before Christmas and send the link to Coco's family to let them see the wide reaching influence Mike's life and work had on the extended international circus family. I'm back home again but too tired to blog about it all tonight. I'd love to tell you all about the wonderful time that I had this weekend, and I will just as soon as Sarasota lets me come home! At this point I've lost this morning's booking as well as this evening's as I won't be leaving here for Atlanta anytime before 3:00. I'm in kind of a berzerker rage at the moment so, if you'll excuse me now, I have to go downstairs to the ticket counter and disembowel a Delta employee with my breakfast spork from Bamja Juice.